One of the major highlights of Kazakhstan President Nursultan Nazarayev’s visit to the US was an exchange of remarks with Donald Trump that suggested the Minsk talks on Ukraine may be moved to the Kazakh capital, Astana. Nazarbayev was in the US from 16 to 18 January and according to the Russian agency Interfax, Trump suggested moving the Minsk talks on resolving the conflict in Ukraine someplace else, and discussed it with Nazarbayev. “We discussed the fact that Minsk-1 has slumped, and a Minsk-2 is needed. He (Donald Trump) says: “Let’s hold it someplace else”. I say “Let’s do it”,” Nazarbayev said in a press conference after the UNSC meeting in New York on Thursday (18 January). “Originally this all was supposed to be in Kazakhstan. I made trips to gather everyone so that the meetings are there. We agreed to work in this direction,” Nazarbayev added. Kazahstan has crafted an image of itself as an international mediator. It is a historic fact that Astana was considered for the venue of the Ukraine talks since the beginning, but ultimately the talks between Ukraine and Russia, with the participation of France and Germany, took place in the capital of Belarus in 2014 and 2015. Kazakhstan is keen to help with a solution to the conflict in eastern Ukraine. The country is home to some four million ethnic Russians and 300,000 ethnic Ukrainians. Astana loathes to see the deterioration of relations between these two brotherly nations. 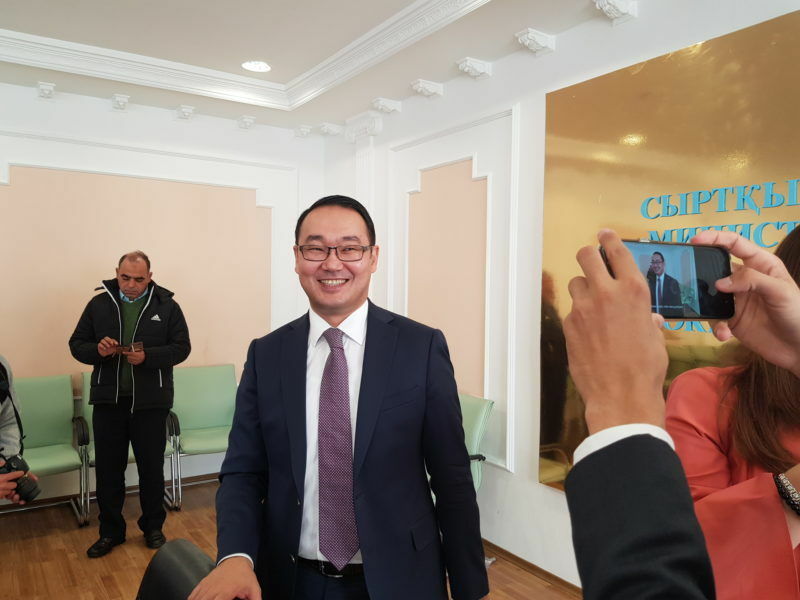 Kazakhstan is ready to continue its role as a facilitator of international dialogue and mediation, Yerzhan Ashikbayev, Kazakhstan’s deputy foreign minister, said as he briefed reporters in Astana on Tuesday (31 October) and answered many questions about the ongoing Syria talks, North Korea and eastern Ukraine. “The Minsk agreements have slumped, I think. Now the peacekeepers should be deployed in Donbas and Luhansk so that they establish a border. Their views should be agreed somehow, brought to understanding. As of today, there’s no mutual understanding,” Nazarbayev said. But Russia-Ukraine relations continue to deteriorate. Ukraine’s parliament yesterday formally recognised its eastern war as a “temporary Russian occupation” in a vote that an outraged Moscow said was preparation for a new wave of the conflict. 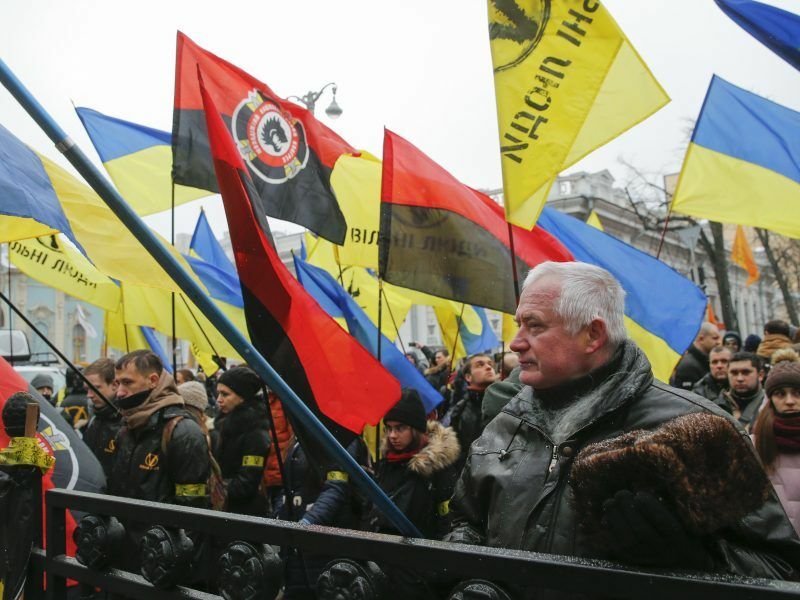 Ukraine’s parliament yesterday (18 January) formally recognised its eastern war as a “temporary Russian occupation” in a vote that an outraged Moscow said was preparation for a new wave in the conflict. Nazarbayev said, according to Kazinform, that Trump is not like any other US president he met with, adding that he appreciates Trump’s business background and the fact that “he doesn’t like empty words”. Nazarbayev, the leader of the country since its independence from the former Soviet Union in 1991, has met with all four US presidents since. During his press conference in New York, Nazarbayev commented on the country’s presidency in the UN Security Council, which takes place during this month. He said he was nervous during the session of the UNSC, which he called the presidency’s “flagship event”. Presiding over the UNSC meeting dedicated to nuclear non-proliferation, Nazarbayev spoke both in Russian and in Kazakh. (Russian is also used in Kazakhstan as an official language.) He first gave the floor to UN Secretary General António Guterres. 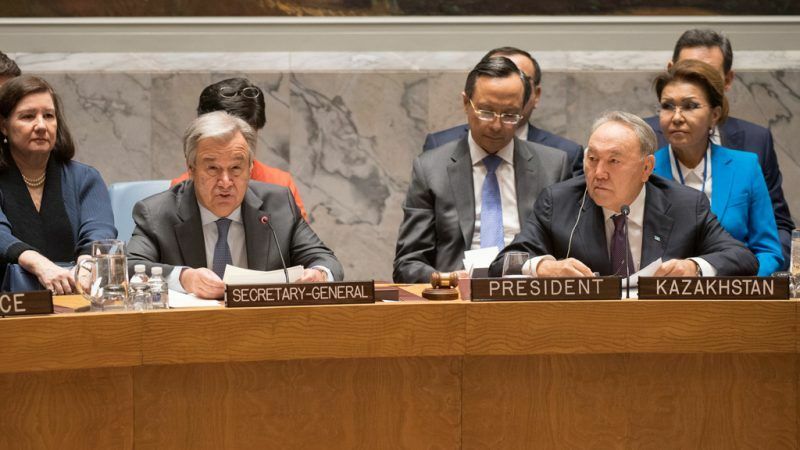 Guterres thanked Nazarbayev for his “personal leadership” and stressed that the threat posed by weapons of mass destruction remains and seems to be gathering force. Global anxiety about nuclear weapons is at the highest since the Cold War, said Guterres, adding that the situation in the Korean peninsula is the most tense and dangerous peace and security challenge in the world today. “I remain deeply concerned over the growing risk of military confrontation and immeasurable consequences that would result,” the UN Secretary General said. “Trust on nuclear and other issues between the US and Russia continues to ebb. Vital strategic reduction measures established during and after the Cold War are under threat”, Guterres said, adding that after the expiration of START (Strategic Arms Reduction Treaty) in 2021, there seemed to be no appetite to negotiate new nuclear arms reduction treaties. Guterres regretted that the Iranian nuclear deal is being questioned. The international agreement, which is in the interest of the Iranian people and of the international community, should be preserved, he insisted. 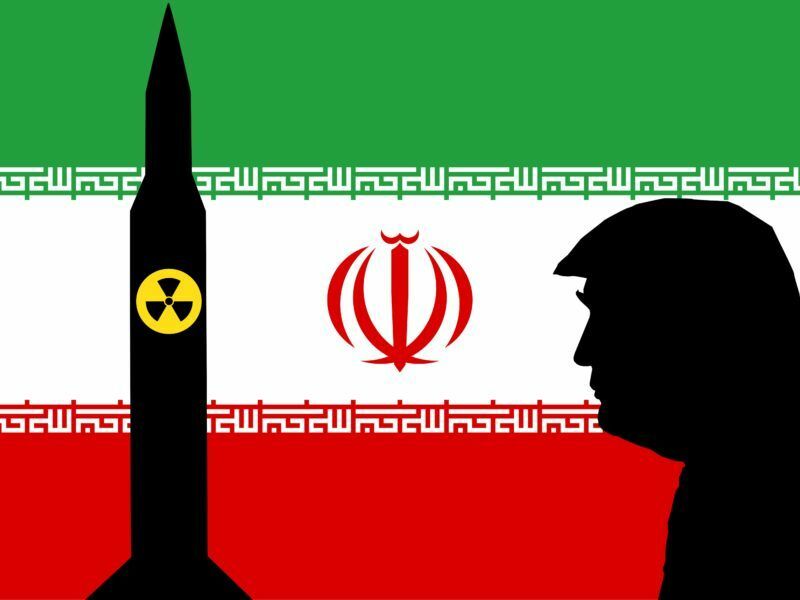 A bill was introduced in the US House of Representatives yesterday (18 January) aimed at tightening the terms of the Iran nuclear deal, despite Tehran’s rejection of changes to the accord. In the Syrian conflict the use of chemical weapons seriously challenges the global taboo against this type of weapons of mass destruction, the UN Secretary General also warned. Nazarbayev said that Kazakhstan considers its UNSC stint as a sign of confidence of the international community in the country’s peaceful policy. “We have become the voice of the region,” he said, confirming previous announcements that Astana would give a voice to Central Asia – its neighbours Uzbekistan, Turkmenistan, Kyrgyzstan and Tajikistan. Nazarbayev said that his country had achieved high international standing specifically by renouncing nuclear weapons, and called on other states to do the same. “We have called on Iran, now we call upon North Korea to do so,” he said. Leaving behind the division of countries in military blocks, which he called “provocative and meaningless in the 21st century”. He mentioned his initiative of achieving a nuclear weapon-free world by the UN centennial in October 2045. Supporting the Iran nuclear deal for which he said his country gave its contribution. He mentioned he spoke to Trump and discussed the issue. “An understanding rose that in principle, we can surmount this issue.” A similar constructive approach can be applied for the settlement of the North Korea nuclear problem”, he said. Promoting the establishment of nuclear weapon-free zones. He also warned of the risk of a new wave of arms race based on new scientific achievements. The international community should strengthen control over the creation and proliferation of new military and information technologies, Nazabayev said. He concluded by saying that issues can be solved provided there is trust among the nuclear powers. The session was attended by President of Poland Andrzej Duda. Poland too is a non-permanent member of the UNSC for 2018-2019. 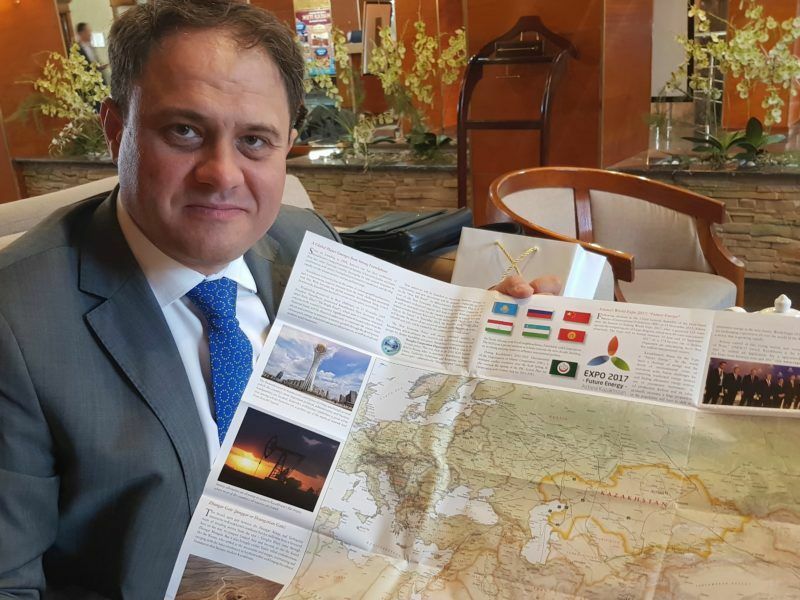 Duda praised Kazakhstan for being credible on nuclear non-proliferation, which in his words is reinforced by the fact that it is one of the very few countries that abandoned nuclear weapons. On 29 August 1991, Nazarbayev announced the closure of the Semipalatinsk nuclear test site and the ban on nuclear weapons on Kazakhstan’s territory (the Soviet weapons positioned there could have made it the fourth largest nuclear power after Russia, the US and France). Ukraine too gave up its nuclear arsenal, a move it probably regrets today.